Take pictures and videos of the job you need done. Add as much information as possible like measurements, sizes, materials supplied etc. The more information given the more accurate bids you'll receive! 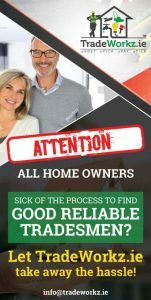 Pick the tradesmen best suited to you. View their recent work, read reviews. Guaranteed competitive prices to choose from. Finalise a deal and organise a time through the site using our trade chat system with your chosen professional. Once the work is completed and your happy with the quality you can pay through our site using your card or pay with cash. With the work done and paid for you can rest easy knowing it's one Job crossed off you’re to do list. TradeWorkz.ie was founded by Cian along with his brother Shane. The two brothers from Cork have worked together in the construction industry all of their working lives. Although the brothers are only 21 and 25 years old ,they have gathered a huge amount of experience between the two of them. This is where the idea for Tradeworkz.ie was born, through their own first hand encounters with various tradesmen and the general public. Almost 2 years of planning and work have gone into the site. There was a pattern of complaints from both sides. TradeWorkz.ie was developed as an answer to their problems. 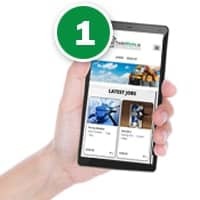 TradeWorkz.ie wants to revolutionise the way tradesmen find work and how the general public find good reliable tradesmen. We have simplified a tedious process down to an effortless task. Its optimised for mobile/tablet and desktop use. TradeWorkz.ie are currently in the development stage of turning the site into an app. We strive to deliver a sleek, efficient, easy to use model that even a computer novice can use. TradeWorkz.ie will revolutionise the apprenticeship sector in Ireland. We want to break the unfair practice of agencies taking a commission on an already low paid apprentice. TradeWorkz.ie have a page dedicated to be solely used for locating and advertising an apprenticeship. 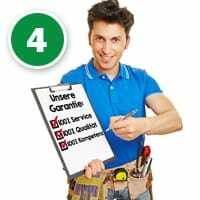 We create a direct channel to hundreds/thousands of tradesmen in multiple professions. Our Tradechat feature allows tradesmen and the public to converse directly through the site using private messages. We want to see companies grow and help them reach their full potential. 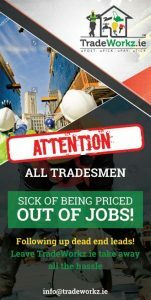 TradeWorkz.ie will prop up the good reliable tradesmen and knock down the cowboys of the industry. Start your free trial with TradeWorkz.ie today you won’t be disappointed. A percentage of the proceeds from every membership will go to cork D.A.W.G for the up keep and welfare of their animals. There a great non profit, self founded organization that do amazing work for abandoned and abused dogs. A link for their website can be found In our footer. We are a new innovative website (with an app pending) for all trade professionals. We cater for every type of profession. The day of being priced out of jobs or following up dead end leads are over. The future of getting/pricing jobs is TradeWorkz.ie! We don’t believe in a commission basis for work you acquire through our site your hard earned cash is yours to keep! TradeWorkz is a membership based site with three different packages to suit the needs of every professional with many added bonuses. There’s 3 months free trial to test it for yourself. Build your business and reputation up together with us. We are a new innovative website (with an app pending) for tradesmen and the general public. Our team work hard to bring tradesmen and potential customers together in an easy simplistic way that has never been done before. It is free and always will be to post a job on our site and we cater for every profession or service you require. The day for ringing around trying to find a tradesman to come and quote you for a job is over! The future is here! Follow our simple steps uPost uPick uPay uTick and see for yourself. Our user friendly site is optimised for mobile/tablet and desktop use. We simplified the process so even a computer novice can use it.